Harder marbles, serpentines, and stones like granite cannot be worked well with Rasps and Files. To uniformly and regularly smooth surfaces on these stones the most efficient means of refining contours and smoothing surfaces employs a variety of different types of Abrasives. 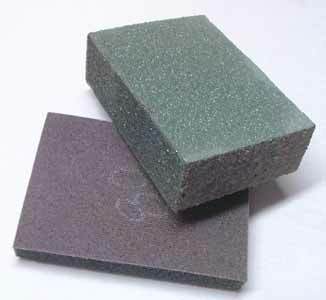 This category of tool includes types of Sandpaper commonly available at hardware suppliers, but also includes a number of abrasives in forms specific to the stone-working industry. Though the coarser abrasives can be used dry, when working the finer abrasives employing either a water slurry or rinsing the workpiece frequently will allow the abrasive particles better access to the surface being worked. abrasive wheels . 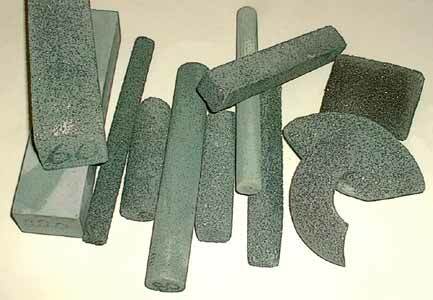 . .
One on the most commonly seen uses of silicon carbide abrasive is the commonly available waterproof sandpaper as shown below in the various different grit samples. Though there are several ways of grading grit size, the most common one in North America is simply the size of the mesh screen that filters and sorts the particles: 100 grit signifies the largest particles that have been filtered through a mesh that has 100 strands to the inch, 120 grit is filtered through a mesh that has 120 strands to the inch, 600 grit is filtered through a mesh that has 600 strands to the inch, etc. 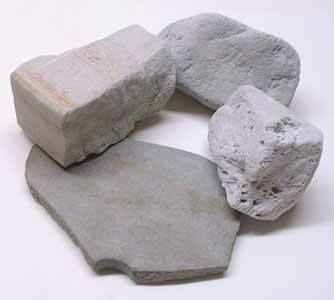 Before the advent of manufactured forms or of synthetic abrasive materials, the abrasives most commonly used to work stone were either loose particles of sand used in a slurry, and smaller chunks or blocks of naturally-abrasive stone harder than the stone being worked — most often sandstones and pumice. Standard size sheets of sandpaper are usually too large to work comfortably by hand, whether they are wrapped around a sanding block or just held in the fingers, so other they are folded or torn down into smaller sizes. When torn down sometimes the printed grit size is lost, and identifying or distinguishing between the different fine grits is very difficult — one solution to this problem (shown above) is to precut all the sheets of the different available grits to the same size, keeping them in the correct sequence, and stapling them together so that in use the sequence is easy to follow. (above)Two pieces of natural sandstone (fragments from old grinding wheels at left and bottom) and two chunks of natural pumice. Sandstones are sedimentary stones that contain particles of hard sand cemented together in a usually softer matrix, while pumice is essentially a fine glass froth created during explosive volcanic eruptions. 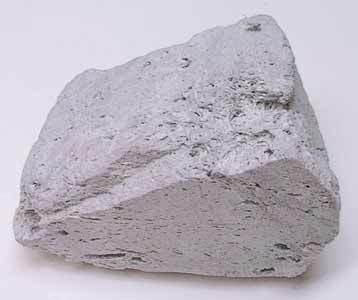 Though porous and lightweight enough to float on water, the open-celled structure of the pumice fractures during use, constantly renewing the sharp edges of the cell-walls to produce a highly abrasive but very fine working surface. The image at right shows the fine open-celled structure of pumice. In 1891 Edward G. Acheson was searching for a way to make artificial diamonds and he heated a mixture of clay and carbon to create silicon-carbide crystals, thereby inventing the first synthetic abrasive. Though it wasn’t quite as hard as diamond — only about 9.5 on the Moh’s scale where diamond is 10 — it was quickly adapted to many uses in the stone working industry, including grinding wheels, handheld rubbing blocks, and attached to sheets to make sandpaper. By the early 1900s the use of synthetic abrasives had overtaken the use of natural abrasives throughout industry. Depending upon where they were first deposited and then later quarried, natural stones vary in the proportional sizes of the of abrasive particles cemented together overall, thus allowing finer or coarser abrasive cutting properties. Softer stones such as alabaster or soapstone can be sanded to a polish fairly easily by using one out of every two or three grits in the sequence, but the harder the stone the more important it becomes to use every grit in the sequence so as to efficiently remove the scratches left from the previous grit. Because the scratches show up on the surface as a light color, darker stones also are more demanding of a thorough procedure than light-colored stones. 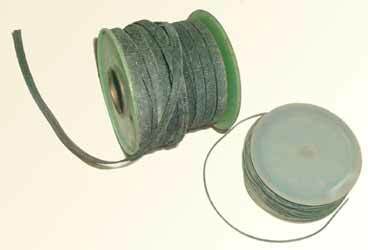 Other forms of silicon carbide abrasive that are available for hand use are foam sponges that have the abrasive on the surface — thereby eliminating the need for a separate sanding block — and cords and tapes which allow some types of very difficult to reach areas to be worked easily. In 1955 synthetic diamonds were finally achieved on a scale that could be used by industry, though it would be a couple of decades before their use became widespread throughout the stone industry when their relative high cost could be offset by the efficiency of the new tooling required. The set of seven hand diamond pads shown below — from the green 'extra coarse' to the orange 'high polish' — are in the following grit sequence: 60, 120, 200, 400, 600, 1800, 7500. In the coarser grits (60 to 400) the diamonds are bonded to a thin flexible metal plate that is then attached to the foam pad. The finer (600 to 7500) grits for polishing are embedded in a soft resin (the polka dot pattern) on the surface of the pad. 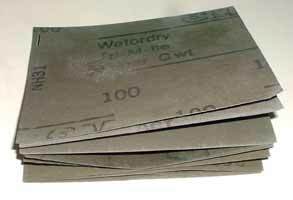 These pads can outlast regular sandpaper hundreds of uses if applied with light pressure in a water wash.
being abraded more quickly than the harder areas — thus keeping the contours more uniform. 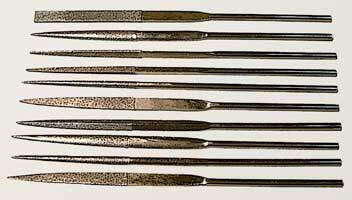 Diamonds are also bonded to the surfaces of Needle Files and Rifflers so their unique properties can be used in those hard-to-reach areas on the hardest stones. 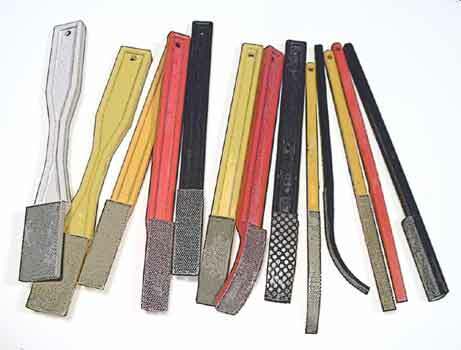 The available grit range is usually much more limited than the pads above, but some suppliers offer custom-made diamond-electroplated tools for workers who need special shapes and grits for their unique applications. Because the diamond dust is bonded on the surface with a thin layer of electroplating, using diamond files dry or with heavy working pressure will drastically shorten the life of the tool.